I’ve been wrestling with this issue periodically, and while it’s not as big a deal as, say, rising sea levels or prescription drug addiction, it’s something that weighs on my mind. As a beer blogger, I’m sometimes approached by brewery-professionals of some stripe to try something they’re selling… but for free. Sometimes it’s in the form of a pint, but I’ve been given a six-pack or even more just for being me. Twice I’ve been mailed beer by a major brewery. This is an awesome event, don’t get me wrong. Sometimes I just feel uneasy with it. I’ve never advertised myself as a reviewer, so it’s not as if I’m a kingmaker or anything like that. I have a small following at best, but I do have a writing platform that extends to people who crave recommendations. I’m a craft beer advocate, and my job is to bring out what’s interesting and trending in the beer world. 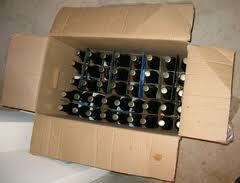 When I get a free box of beer, I feel beholden to the brewer. At no time will the rep say, “So, maybe you’ll put us in your next newspaper column? Huh? Huuuuh?” I’m just a guy who’s prone to guilt, and I feel a little guilty taking something that’s free and not promoting it. Sometimes I genuinely like the product, and I’ll review it honestly. That doesn’t take the sting out of the transaction. Beer I was so-so on either gets unmentioned or rated vaguely (“it makes a statement” or “the beer is meant to be drunk”). There’s a certain flaccidity to the writing because there was no actual discovery or research. In my disclosure, I mention that I sometimes get free beer samples, but that I try to be unbiased in my assessments. I love restocking my fridge, but I’m conflicted. Should I refuse future freebies altogether? Should I take the beer and take it as a sign to promote? Should I go completely out of character and denounce a beer just to see what happens? 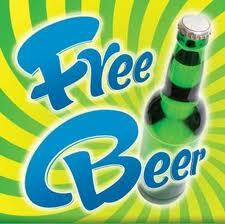 If you’re worried about free beer once and a while, you’re probably overthinking it. It’s a common enough practice to sample a product that you’re writing about, be it food or jet skis or luxury hotels. Still conflicted? Then either refuse the beer or be honest with the profferer. Tell him or her: “I appreciate your gift. I just have to say that I can’t trade this for a good review or anything.” Ninety-nine percent of the time the beer-professional will say, “Hey, that’s cool.” Because beer people are awesome. And they’ve probably got a budget to give away beer anyway. It’d be rude to say no. That’s my free advice. And if you refuse to take it, I’ll be offended. This entry was posted in Beer Snob and tagged blogging. Bookmark the permalink. Thanks for the advice. As someone who’s just recently started beer blogging, I appreciate the article. I’ve also had a few mixed feelings, but my best advice is to always disclose on the review of free beer. While I don’t think it should persuade any professional review, I do think free beer tastes a bit different than store/pub bought beer. I also agree about the budget for free gifts/beer. Sometimes a brewer might just want to say thanks or say you’re blogging is appreciated, especially if the gift is from a brewer that you’ve talked/mentioned in the past. Brewers and people in the beer industry (including bloggers) are generally nice and would probably buy you a pint at the pub, if they knew you there anyways. I sometimes have to write out what I’m thinking before the answer comes to me. Best of luck with the beer blogging. It’s fun, and you usually end up meeting some great folks.